Monday – Friday; 8:30 a.m. to 4:30 p.m. 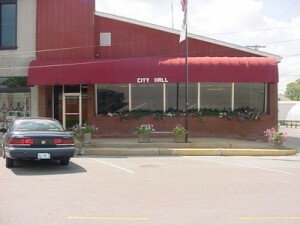 The City Hall is located at 215 N. Monroe, which is 1.5 blocks north of U.S. 54. Monroe Street is located on the east side of the Pike County Court House. The City Clerk’s Office Staff is located in City Hall. The staff maintains the records for the City; monitors the appropriations and bills of the various City Departments; sends billings for sewer, water and gas usage to the residents of the City and carries out other duties and responsibilities associated with the operation of City government. April 30, 2017 The Mayor is the Chief Executive Officer for the City of Pittsfield. This person presides over City Council meetings, ex-officio member of all City committees, appoints residents to Library Board, Park District Board, City Planning Commission, Lake Advisory Committee and appoints Alderman to City Committees. The Mayor works with the Aldermen in developing the annual budget, supervises all City employees and represents the City of Pittsfield at various functions in and out of the City. April 30, 2017 Maintains the records of the City; Monitors appropriations and bills; Is the central contact for all City Departments; sends bills and collects payments for water, sewer and gas utilities to residents of the City; Answers Freedom of Information requests; responsible for all local, state and federal reporting of City funds and taxes; Serves as recorder for City Council meetings; Supervises the office staff. Fax: 217-285-4485 Responsible for administering the ordinances for the City of Pittsfield. April 30, 2017 Keeps an accurate record of the income and expenses of the City. Prepares and presents a monthly financial report to the City Council. Email: mnewman@pittsfieldil.org Provides assistance to new businesses as well as existing businesses that are planning to expand. Maintains the web site for the City. Provides assistance to the Mayor, Aldermen and City employees regarding economic development needs. Represents the City at functions if the Mayor is unable to attend. Collaborates with City, County and State economic development organizations on economic development issues. Provides technical assistance to organizations in the City for grants.